3 Ingredient Oreo Ice Cream is another easiest Ice Cream Recipe made with minimal ingredients without Ice Cream maker. It is the easiest and heavenly Ice Cream you can make at home. 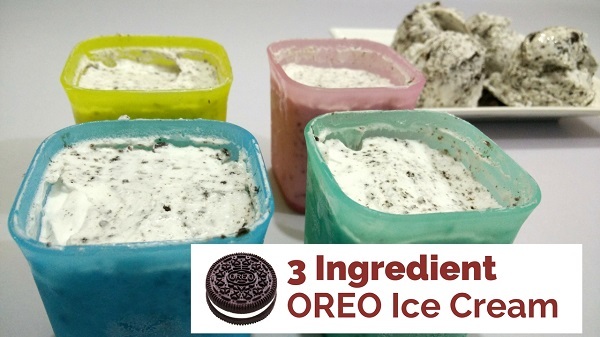 Learn how to make this delicious Oreo Ice Cream at home. I have used Tropolite whipping cream in this recipe. If you are using any other brand unsweetened whipping cream, I suggest you add 2 cups condensed milk instead of 1 cup to maintain sweetness. Break 4 – 5 Oreo Cookies in small pieces. Coarsely grind remaining Oreo Cookies in a food processor. Keep Ice Cream bowl in refrigerator for 30 minutes before making Ice Cream. Add Whipping Cream and Condensed Milk in a chilled bowl. Whip using a hand blender at medium speed for about 2 minutes. After 2 minutes whip at high speed till it increases more than double in volume. Add coarsely ground Oreo and also add small pieces of Oreo Cookies. Gently mix well all ingredients. Shift the Ice Cream base into an airtight container. Refrigerate for 6 – 8 hours until set. Scoop and serve chilled Oreo Ice Cream.